Mike Friend spent 36 years with Boeing, rising to positions as Chief Engineer and Technology Director. His technical and linguistics abilities helped make him a world traveler, creating the first fuel-cell powered airplane in Spain, for instance, in 2002 through 2008, when the demonstrator craft first flew. That was the first of many hybrid designs Mike would work on, with samples of his work on display this month in Beijing. At the E-Flight Forum, sponsored by Siemens, he held forth on single-, two-, and five-seat configurations that could benefit from hybrid power. He explains, “For a production aircraft, you need to think about more than just the bare battery cells. 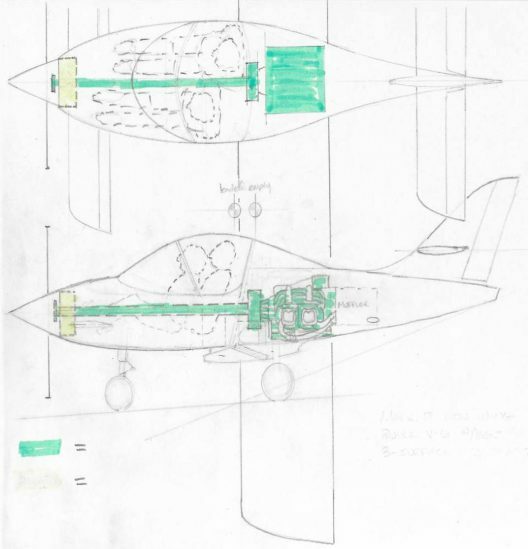 You need to consider the weight of the BMS, cell cooling/heating, charging/swapping provisions, and a containment system acceptable to the FAA.” To match performance of a gasoline-powered airplane, He’s not waiting for the 350 Watt-hours per kilogram in complete battery packs for that to happen, instead turning to several hybrid designs he hopes to produce. At a six-percent per year projected improvement in batteries, Mike sees a window between now and 2032 in which hybrids will be prime movers in the sky. Each type has possible uses in small airplanes. His single-seat design, the MF6, uses a series/parallel hybrid configuration with a minimum part count and no duplication. 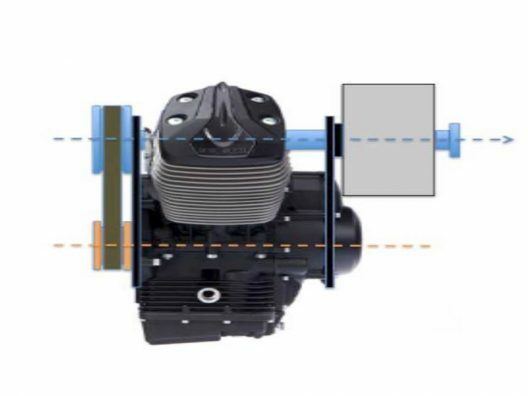 A Moto-Guzzi motorcycle engine coupled to a Siemens electric motor can use both power sources simultaneously for rapid takeoff and climb, or use only one unit for economical cruising. The Siemens drive motor acts as the starter for the Moto-Guzzi, and allows the use of a single motor/generator controller. The 50-horsepower engine can run alone, or with the motor. The gas engine can shut down and the airplane can fly on electric power alone. This “twin-engine” safety with a single propeller allows the use of an off-the-shelf engine. Mike’s two-seater is a three-lifting surface machine with a midship-mounted UL260 80-horsepower engine driving the nose-mounted propeller through a long drive shaft that passes between the two occupants – ala Molt Taylor’s later designs. Power can be augmented by the nose-mounted Siemens motor. 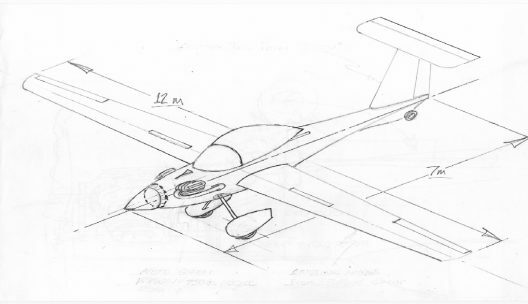 His five-seat touring aircraft, looking a great deal like the RFB Fan Trainer of the 1970’s, would couple a Wankel rotary engine with a Siemens motor to drive a common fan in a ducted housing. Five seats is halfway to the 10-seat Zunum, a hybrid airliner for which Mike is on the technical advisory board. These craft all require careful design and assessment of what their performance potential might be. Mike thinks designs are often predicated on optimistic assumptions regarding battery performance, systems weight, and aero performance. 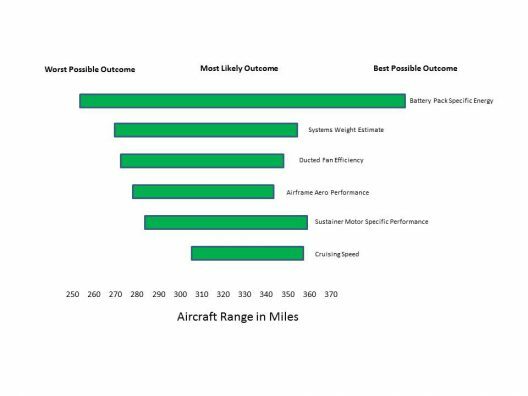 Wrong estimated based on wrong assumptions lead to designing the wrong airplane. To overcome this, he advises using a “tornado diagram” which incorporates realistic looks at how bad things can be at the worst end of a design as well as the rosiest of estimates. As often happens, the truth lies in the middle (at least of the diagram). While Mike feels an affordable all-electric airplane is not a near-term possibility for most of us, hybrids can be offered with current technology, with all electric flight possible for short hops. He concluded his Beijing talk with the prediction that, “In the near future, an airplane configuration built specifically around hybrid electric propulsion will be measurably better than today’s internal combustion based configurations.” May it be so.